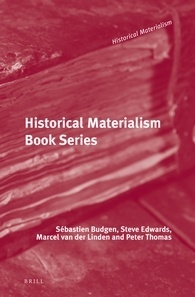 The Historical Materialism Book Series is a major publishing initiative of the radical left. The capitalist crisis of the twenty-first century has been met by a resurgence of interest in critical Marxist theory. At the same time, the publishing institutions committed to Marxism have contracted markedly since the high point of the 1970s. The Historical Materialism Book Series is dedicated to addressing this situation by making available important works of Marxist theory. The aim of the series is to publish important theoretical contributions as the basis for vigorous intellectual debate and exchange on the left. We are convinced that a project of this kind can make an important contribution to the revitalisation of critical politics and intellectual culture.The peer-reviewed series publishes original monographs, translated texts and reprints of ‘classics’ across the bounds of academic disciplinary agendas, and across the divisions of the left. The series is particularly concerned to encourage the internationalisation of Marxist debate, and aims to translate significant studies from beyond the English speaking world. We have previously published important studies of Marxist thinkers, key collections of sources from the socialist movement, works of philosophy, history and literary criticism, as well as political and economic studies. Future publication plans include texts in the fields of cultural and aesthetic theory, sociology and geography. The Historical Materialism Book Series will expand significantly over the coming years with substantial and important books in all areas of Marxist theory. We are undertaking a project of publishing previously untranslated texts by Marx, long unavailable debates from the 2nd and 3rd Internationals, and English editions of important studies from the post war period. Equally significantly, we also aim to publish the work of the emerging generation of Marxist scholars and theorists. The Historical Materialism Book Series intends to be at the forefront of radical publishing for the coming period with a commitment to rigorous intellectual work produced within the many Marxist traditions. You may place (or cancel) a standing order to a Book Series with our distributors: brill@turpin-distribution.com or cs@brillusa.com (Americas). For enquiries, please contact sales-nl@brill.com.